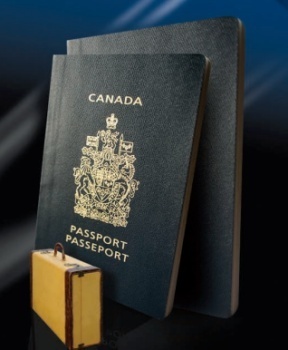 British Game Dev Decries Canadian "Vultures"
British game developers are "furious" over a stunt at a recent U.K. industry conference that used fake passports to encourage them to pack up and move to Canada. It's not exactly the '72 Summit Series but a certain tension between Canada and the U.K. has existed for years thanks to the former's generous tax breaks for game developers and the latter's refusal to give up a single shiny penny. It got to the point that a few years ago the U.K. government publicly mused about a complaint to the World Trade Organization over the Canadian policies and although that turned out to be so much hot air, tempers are rising again in the wake of broken promises for tax relief and a pretty spectacular Canadian zinger. It's not exactly Bobby Clarke viciously breaking Valeri Kharlamov's ankle, but the decision by Quickstart Global to place fake Canadian passports on the seats at the Game Horizon Conference in Newcastle last week stung nonetheless. "As a British developer it makes me disappointed and angry to see the Canadian government agencies circling the U.K. like vultures as soon as word was out that the Government U-turned on our tax breaks," one anonymous attendee told CVG. Making matters even worse, the Develop Conference being held in Brighton next week is sponsored by the Canadian province of Nova Scotia, which currently hosts a website comparing the "crazy costs" and "very difficult" staffing situation in the U.K. with the much friendlier atmosphere in Canada. "Where's the support for our industry? We get little or no assistance for trade shows abroad and now even our trade shows at home are happening with the 'support' of 'Canadian agencies'," another developer complained. "Are things now so tight that we can't find British companies to sponsor our events rather than having the Canadian Government preying on our talent and companies?" Many members of the videogame industry are angry over the decision to cancel planned tax breaks for the industry following the election of a new government in May, a situation worsened by reports that a major videogame publisher lobbied hard against the plan. TIGA Chief Richard Wilson was somewhat more circumspect, however, saying it's up to the U.K. government to take steps to even the odds. "The Canadians are aggressively competing to make their country an attractive place to make video games," he said. "Until the UK introduces games tax relief the UK video game industry will be at a competitive disadvantage."